Thousands of people along Haiti's north coast have dragged mattresses and chairs outside, fearing new aftershocks. 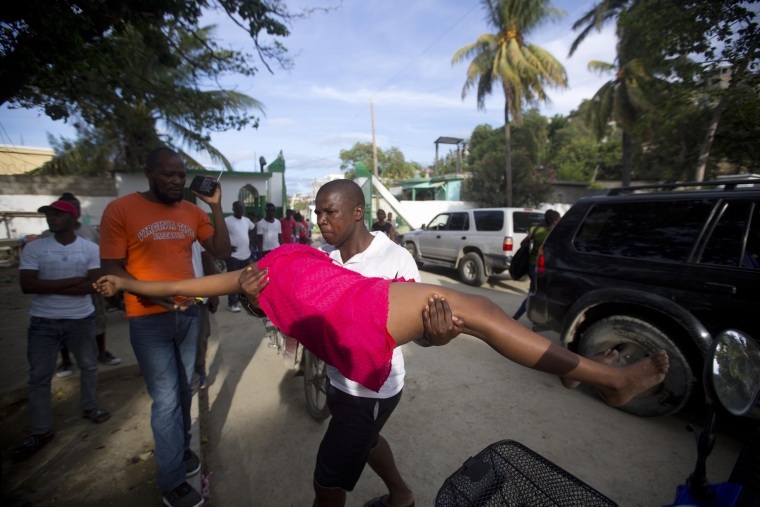 PORT-DE-PAIX, Haiti — The death toll from a 5.9 earthquake that hit Haiti over the weekend rose to at least 15 people with 333 injured, according to updated figures released Monday by authorities, as rescue crews worked to help victims spooked by strong aftershocks. Haiti's civil protection agency said in a statement that it will soon deploy 70 soldiers to the Nord-Ouest and Artibonite provinces that were hardest hit, noting it already sent 14 soldiers along with nurses and doctors to the area over the weekend. Thousands of people along Haiti's north coast have dragged mattresses and chairs outside, fearing new aftershocks. Many wondered how they were going to rebuild from Saturday night's quake and a strong 5.2 magnitude aftershock on Sunday that had residents in the coastal city of Port-de-Paix and elsewhere worried about returning to their cracked cinderblock homes for fear they would collapse. Among them was Marc-Sena Docteur, a 24-year-old carpenter whose girlfriend died in the earthquake. "Now I'm left with a 9-month-old baby with no aid at all," he said. "I'm still crying. I don't know what I'm going to do without her." The walls of the room that the couple had been renting for a year collapsed, and he and the baby have been sleeping outdoors since the quake. Sunday's aftershock caused panic on streets where emergency teams were providing relief to victims after cinderblock homes and rickety buildings toppled in several cities. The U.S. Geological Survey said the epicenter of the aftershock was located 9.8 miles (15.8 kilometers) north-northwest of Port-de-Paix. Among the dead were a 5-year-old boy crushed by his collapsing house. Impoverished Haiti, where many live in tenuous circumstances, is vulnerable to earthquakes and hurricanes. A vastly larger magnitude 7.1 quake damaged much of the capital in 2010 and killed an estimated 300,000 people. Etanvie Dimorne, a 50-year-old mason, said people have to rebuild stronger given the earthquakes that have hit Haiti. He lost his home in Saturday's quake and is now sleeping under a tarp in someone's yard. "Last night it rained," he said. "I have to sleep under difficult conditions." President Jovenel Moise urged people to donate blood and asked international aid agencies to coordinate with local agencies to avoid duplicated efforts. The government did not provide an estimate of the damages. The USGS said Saturday's quake was centered 12 miles (19 kilometers) northwest of Port-de-Paix, which is about 136 miles (219 kilometers) from the capital of Port-au-Prince. It was felt lightly in the capital, as well as in the neighboring Dominican Republic and in eastern Cuba, where no damage was reported. In Haiti, officials have struggled to shore up buildings despite the two major fault lines along Hispaniola, which is the island shared with the Dominican Republic. The damage from the temblors was visible. In Gros-Morne, one bed was covered in rubble, while the exterior walls of some homes were cracked. Others tilted at precarious angles. Pierre Jacques Baudre, a farmer and father of seven, said he was afraid to return to his home after one wall built with rocks and cement crumbled. "The house can fall at any time," he said. The civil protection agency issued a statement saying that houses were destroyed in Port-de-Paix, Gros-Morne, Chansolme and Turtle Island. Damage was also reported at the Saint-Michel church in Plaisance and the police station in Port-de-Paix. Parts of a hospital and an auditorium collapsed in Gros-Morne, where parliamentarian Alcide Audne told The Associated Press that two of the deaths occurred.